Click the image above for details in how to participate in this event. I read 5 out of the 13 books I selected as my goals for this challenge. I started reading Twitterpated by Melanie Jacobson, but did not finish reading it in time. 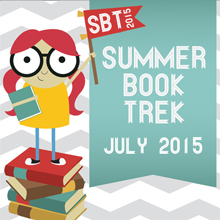 Thanks for a great #SummerBookTrek15 New LDS Fiction. This event runs the entire month of July 2015.